Paulson plan thumbs down because too much power in one person. Entrust responsibility not just to one person. More oversight/accountability necessary. Protection for tax payers in the form of warrants/stock/etc. Learn from the Swedes. Cap on executive compensation for firms that participate in bailout. If executives balk, let them sink or swim on their own. Thank you for your letter expressing concern about Congress’ consideration of a plan to meet our Nation’s credit crisis with financial help from the Federal Government. This is a difficult situation for which there are no perfect solutions, and I would like to share my thoughts and concerns about this issue with you. On September 19, 2008, Secretary of the Treasury Henry M. Paulson, Jr. announced a legislative proposal to use $700 billion to purchase illiquid mortgage-related assets from ailing financial institutions. Secretary Paulson’s three-page proposal was a non-starter, and without critical changes it has no chance of approval from Congress. This proposal would have given a blank check to an economic czar who would have been empowered to spend it without administrative oversight, legal requirements, or legislative review. Decisions made by the Treasury Secretary would be non-reviewable by any court, agency, or Congress. The proposal also lacked a requirement for regular reports to Congress on the status of the program. This was simply untenable. Since this announcement, my offices have received thousands of comments from Californians like you concerned about how this action will affect them. Yet, I believe prudent action must be taken. The bill should include the following principles: a phase-in of funding; oversight, accountability and transparency; a mechanism allowing the Secretary of the Treasury to modify mortgages to prevent additional foreclosures; and a precise cap on executive compensation. The current credit crisis affects all Americans. If action is not taken to stem the crisis, Americans risk losing their homes, jobs, personal savings, life insurance and more. Banks will cease to lend to businesses and homeowners, and credit will be increasingly difficult to come by for average Americans. I strongly believe that the consequences of failing to act now would be greater than not acting at all. Attached please find a statement I recently made on the floor of the Senate expressing my feelings on this issue. Please know that I will keep your thoughts in mind as this situation unfolds. Once again, thank you for writing. If you have any additional questions or concerns, please do not hesitate to contact my Washington, D.C. office at (202) 224-3841. Best regards. 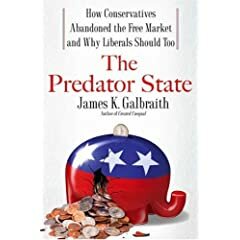 James K. Galbraith, the author of The Predator State: How Conservatives Abandoned the Free Market and Why Liberals Should Too and the son of renowned economist John Kenneth Galbraith, questions whether the bailout is necessary and proposes a new Home Owners Loan Corp., which would rewrite mortgages, manage rental conversions and decide when vacant, degraded properties should be demolished. All five big investment banks have disappeared or morphed into regular banks. Is this bailout still necessary? Next, put half a trillion dollars into the Federal Deposit Insurance Corp. fund — a cosmetic gesture — and as much money into that agency and the FBI as is needed for examiners, auditors and investigators. Keep $200 billion or more in reserve, so the Treasury can recapitalize banks by buying preferred shares if necessary — as Warren Buffett did this week with Goldman Sachs. Review the situation in three months, when Congress comes back. Hedge funds should be left on their own. You can’t save everyone, and those investors aren’t poor. With this solution, the systemic financial threat should go away. Does that mean the economy would quickly recover? No. Sadly, it does not. Two vast economic problems will confront the next president immediately. First, the underlying housing crisis: There are too many houses out there, too many vacant or unsold, too many homeowners underwater. Credit will not start to flow, as some suggest, simply because the crisis is contained. There have to be borrowers, and there has to be collateral. There won’t be enough. > with a transfer of funds of great magnitude. > transfer, it would be most profitable to you. > movement in the 1990s. This transactin is 100% safe. > so the funds can be transferred. > be used to protect the funds.